Every day we’re bombarded with thousands of ads and promotions competing for our unconsenting attention. These companies and organizations are easily able to pay for real estate in our everyday lives. 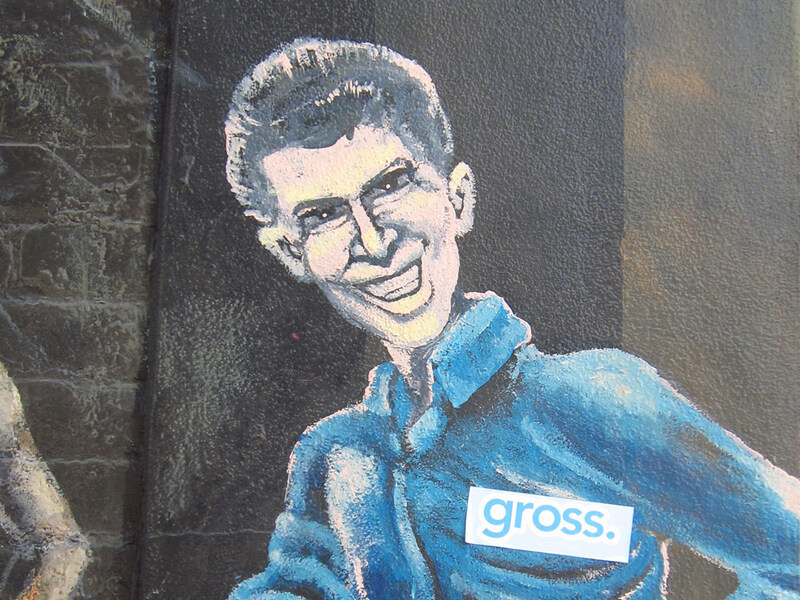 Introducing the gross sticker. Included in every copy of issue 01 is your very first ammunition to fight back. Let people know your opinion. It’s just as valid as any millionaire’s. People are not real estate to be bought and sold. No. Instead, we are in an explicit relationship with these companies. It is guaranteed that they will enter every crevice of our lives given the chance. The flip side of this silent “agreement,” being as most of us do not have the funding or time to launch a full scale campaign against them, is that we are allowed to re-use, re-interpret, re-mix and re-contextualize any of it. No permission is required by either side. After all, Almost Real Things is about collaboration! If you think something is great, reach out, let them know! And if it’s not, tell them it’s gross. We want to see your latest and greatest uses for the gross. sticker! Use #grossthings and mention us on Twitter @almostrealthing or Instagram @almostrealthings.